With mortgage rates also down at approximately where they were in January 2018, the carrying cost of a new house has declined by over 10% overall, enticing lots of new potential buyers into the market. That kind of pricing power smacks of a market that isn’t competitive. In a truly competitive market, the kind of big price increases we saw until 2018 — at sales levels well below any time in the decade between 1995 and 2005 — would have called forth new supply at lower prices. It turns out, I’m not the only one who thought that. 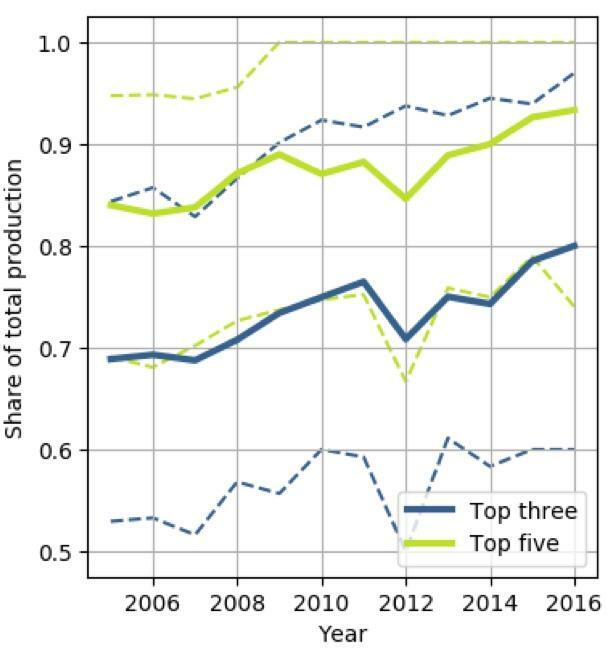 Two economists, Jacob Cosman and Luis Quintero, presented a paper, Fewer players, few homes: concentration and the new dynamics of housing supply, to the American Economic Association last winter, documenting just how much local oligopolization has distorted the market. 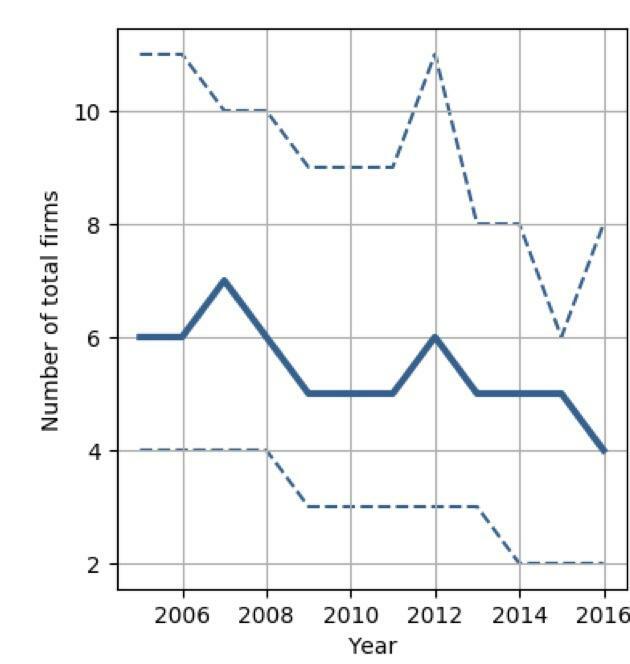 This has declined from 6 to 4 firms in the decade since the bursting of the housing bubble. Each has increased by roughly 10% since the bursting of the housing bubble. An alternative explanation that has been offered for the decline in median house prices since the end of 2017 is the square footage of the median new house that builders are offering is smaller. But a comparison of median prices and median square footage suggests that, while there is an effect, the market power of local oligopolies appears to be the primary driver in both the big increase in new home prices through 2017, and the big decline since. As you can see, house prices continued to rise by over 15% (!) in the nearly 3 years after the median square footage of a new house began to decline after Q1 of 2015. This certainly *isn’t* a decline in square footage driving a decline in prices! The square footage of the median new house has varied between unchanged and -3% in the past four years, both when prices were still increasing, and since prices started decreasing. For some reason FRED hasn’t gotten around to posting the Q4 2018 data for median house sizes (the last quarter for which data is available), but even that is only -2.4%. During that same period (Q4 2017 - Q4 2018) median house prices declined -3.9%. At the most, the decline in square footage explains no more than 60% of the decline in house prices. An alternative explanation — and mind you, I am speculating here, I don’t have data — is that builders have been increasing their profits by decreasing lot sizes, thereby increasing the number of single family houses they can build on any given footprint of land. Note further in the second graph above that median house prices appear to lead median square footage by about 1 to 2 quarters, suggesting that it is the change in prices which is driving the change in square footage, rather than changes in square footage driving prices. A good test of this hypothesis will be if median square footage declines by more than -3% YoY by the 3rd quarter of this year. There are lots of cross-currents in the economy right now. At the absolute tip of the spear is the decline in interest rates since November, which has led to an improvement in some of the housing market metrics. In the shorter-term outlook, a simple quick-and-dirty metric of initial jobless claims (new 49 year lows) and the stock market (just made new all-time highs) suggests all clear. But there are contrary signs as well. For example, the weekly measure of temporary jobs by the American Staffing Association just fell to -1.8%, its worst YoY comparison since the 2015-16 shallow industrial recession. 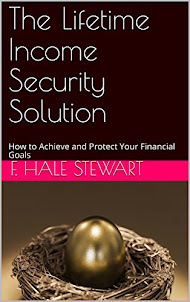 True enough, although if you look carefully, in the lead up to both the 1990 and 2008 recessions there were only two quarters of significant increases off the bottom before the recessions began. Since the latest data in the graph is for Q4 2018, a similar pattern wouldn’t rule out a recession beginning as soon as Q3 of this year, i.e., July. But here’s the interesting thing. The same graph shows that YoY volume of such loans significantly *decelerated* from its YoY peak before 8 of the 11 recessions since 1945, as well as for all of the significant slowdowns, e.g., 1966 and 1995. No big deal, right? At the far right of the graph, the YoY volume of loans was increasing as of March. A very sharp deceleration over the past three weeks. I tend to doubt the deceleration will go too far. But nevertheless something to keep an eye on in terms of another sign of a slowdown. 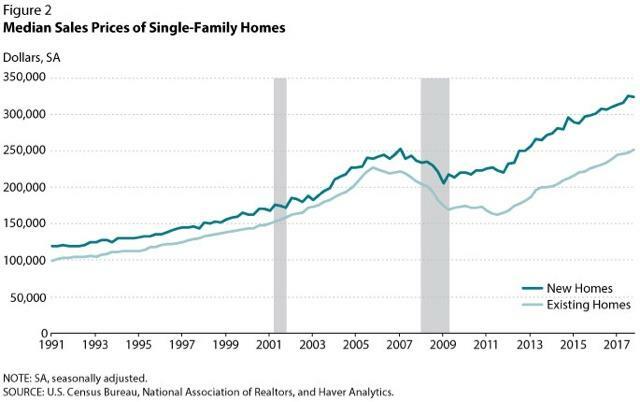 New home sales are extremely volatile, and extremely revised, but they do have the advantage of probably being the single most leading housing statistic, ahead of permits and starts. Subject to revisions(!) 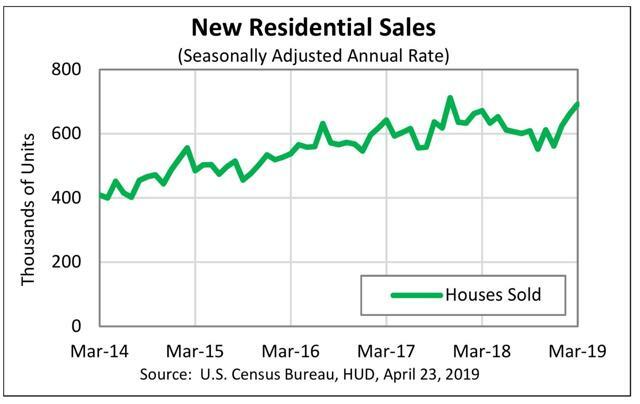 —this morning’s data indicates we’ve already made the bottom in new home sales, and adds to my confidence that we either have just made or will shortly make the bottom in housing permits and starts. 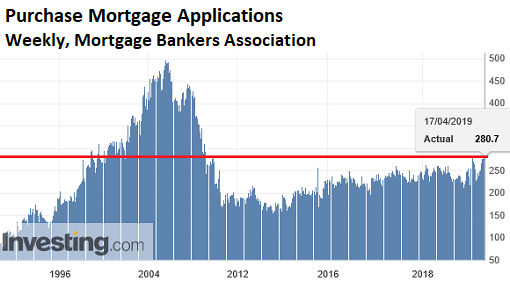 My guess is that interest rates have now stayed lower long enough for new expansion highs to be set in all of the metrics, although because of continuing increases in the price of houses, there is not much room for advances beyond that. Because the long leading indicators turned down in 2018, over the last few months, I have repeatedly looked at the leading employment sectors of temporary jobs, manufacturing, and construction, to check for that weakness feeding through. Today I am taking a closer look at construction jobs. Although, interestingly, construction employment is down slightly from January, while residential employment has continued to increase. To cut to the chase, the peak in YoY construction spending follows permits with usually a one quarter lag. Residential construction employment, in turn, follows spending with one more quarter lag. Both permits and spending are down YoY as of the most recent data. Employment is merely decelerating. So when might we expect residential construction employment to turn down meaningfully? I next broke out permits vs. housing completed, and compared both of those to residential construction employment. Here’s what I got. In both cases, residential construction employment coincided most closely with housing completions. Note that in the 1980s, this most closely tracked single family homebuilding. It be tracking total units more closely now. This may explain why residential construction employment has not turned down meaningfully yet. In the past 50 years, with the exception of one outlier - 1978, in which completions actually led by 4 months - the peak in units under construction has led the peak in completions by between 1 and 5 months. Note that units under construction, for now, last peaked in January. Completions may have peaked in February.That means, if January was the peak for units under construction, we should expect completions, and residential construction employment, to turn down meaningfully no later than June. Mueller’s report makes clear that, first of all, he made “no finding” as to the narrower question of criminal conspiracy, which requires an actual or tacit agreement, rather than encouragement and coordination, I.e., “collusion.” Further, he explicitly qualifies his “no finding” by noting gaps in the evidence, in the form of witnesses who refused to testify under oath, and/or deletions of crucial communications Mueller’s report leaves open the possibility that the conclusion could change if the missing evidence were provided.